Where Are They Now? spotlights Minnesota Varsity Featured and Showcase Artists and Composers from 2011 to 2018. Attends: University of Southern California, Los Angeles, Calif. Classical MPR's 2017 Minnesota Varsity competition was an incredible experience and sent me on a path toward greater confidence, increased success, new clarity for my future, and most importantly, a growing audience of supporters. There are not enough words to express how grateful I am for the experience of recording Lalo's Cello Concerto in D minor in the Maud Moon Weyerhaeuser Recording Studio, giving interviews, playing in the live broadcast at the historic Fitzgerald Theater, and greeting appreciative audience members after the concert. Later that month, I won First Prize in the High School Division of the Schubert Club Scholarship Competition. I also won the Greater Twin Cities Youth Symphony concerto competition and had the honor of performing the concerto with my orchestra that spring. 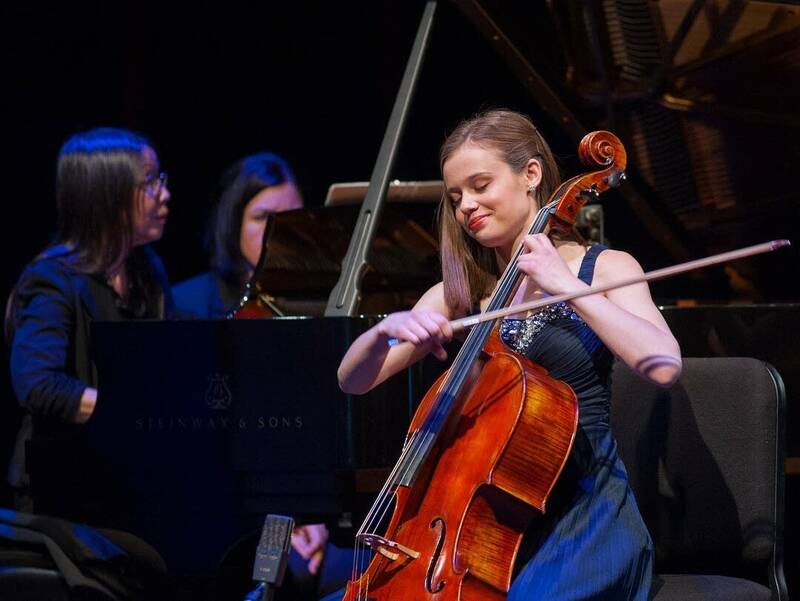 It was a wonderful season with that concerto, and these experiences culminated in my decision to pursue a degree in cello performance in college! Thanks to my teacher, Mina Fisher, and six intense weeks at the Bowdoin International Music Festival, I learned new repertoire which I used for college auditions and a few more competitions during my senior year. Dvorak's Cello Concerto in B minor is something I had always dreamed of playing. As a matter of fact, I asked my teacher more than once if I could play this concerto, and she would tell me I had to wait. Finally, I was ready. With this famous and beloved concerto, I won the La Crosse Symphony Rising Stars Competition in January 2018, and returned to perform as a guest artist with the symphony later that Spring. In March, I won First Prize in the High School Division of the Thursday Musical Young Artist Scholarship Competition. Competing in Minnesota Varsity and several competitions thereafter, traveling for college auditions on weekends in February, keeping up with my senior year, performing in the Salon se Lève Young Artist Concert Series, and presenting my own senior recital with pianist Kerri LeJeune, are experiences that prepared me for college and beyond. Just days before graduating with High Honors from Maple Grove Senior High, I traveled to Washington D.C. to participate in workshops and perform Chopin's Polonaise brillante at the Kennedy Center for Performing Arts. It was an honor I received after being named one of four winners in the VSA (Very Special Arts) International Young Soloist competition. While I was there, it was the 101st anniversary of John F. Kennedy's birth, and I am so thankful for what JFK and his sister Jean Kennedy-Smith did to support the arts in this country. I met artists from around the world and had an extremely positive experience! Just days after my high school graduation, I had the wonderful privilege of going on tour in Eastern Europe as Principal Cellist with the Greater Twin Cities Youth Symphonies, conducted by Mark Russell Smith. I had worked hard in November and early December on a fundraiser I created to pay for the expenses of the trip and felt especially fortunate for opportunities such as hearing the Berlin Philharmonic in concert, performing at the Penderecki Center in Poland, taking a beautiful boat tour on the Danube River, and performing at the MoM Cultural Center in Budapest. One of the most memorable moments came when the audience's vigorous clapping turned into unison, rhythmic clapping. We learned that this is how European audiences show the highest level of appreciation. It happened several times on tour, and we often ended up playing the encore pieces we had prepared. After carefully considering my college acceptance offers this Spring, I decided to commit to the University of Southern California (USC) to study with one of today's legendary teachers, Ralph Kirshbaum, on full scholarship. I later learned that I was the only undergraduate student accepted into his studio! I am extremely grateful for this opportunity and will work to make my family and my home state of Minnesota proud of me. To everyone who voted to give me the added distinction of Audience Favorite in 2017 Minnesota Varsity, thank you. You helped me believe in myself at a critical time.